St. Augustine, Fla (March 26) The 16th Annual Florida's Birding & Photo Fest is fast approaching. From April 18 - 22, 2018, one of the most popular events among birding, nature and photography enthusiasts in the southeast will take place on Florida's Historic Coast - St. Augustine, Ponte Vedra and The Beaches. WHO: Instructors are a "Who's Who" of photographers including Bobbi Lane, Lee Varis, Roman Kurywczak, Scott Bourne, Lewis Kemper, Lisa Langell, Chas Glatzer, Joe Brady, Vinny Colucci, Brett Wells, Shiv Verma, Jack Rogers, Kevin Loughlin, Dan Walters, Stephen Ingraham and more. WHERE: Guana Tolomato Matanzas (GTM) National Estuarine Research Reserve, 505 Guana River Rd., Ponte Vedra, FL. PHOTO CONTEST: Photographers can submit their best photos to Florida's Birding & Photo Fest 2018 Photo Contest. The winning image receives a Sigma 100-400 mm lens and will be featured in the festival's 2019 promotions. The deadline to submit is Friday, March 30. Take a look at last year's winners. KEYNOTE EVENT: The public is invited to attend the festival's keynote presentation Friday, April 20, 6:30-8:30 p.m. at the Pioneer Barn, 259 San Marco Ave., St. Augustine. Keynote speaker is Lisa Langell, a nature photographer who has won honors and awards from the National Wildlife Federation, the North American Photography Association and more. Tickets are $15 and can be purchased online at FloridasBirdingAndPhotofest.com. Florida's Birding & Photo Fest is sponsored by Canon, Fujifilm, Hunt's Photo and Video, Sigma, Sony Olympus and Panasonic. 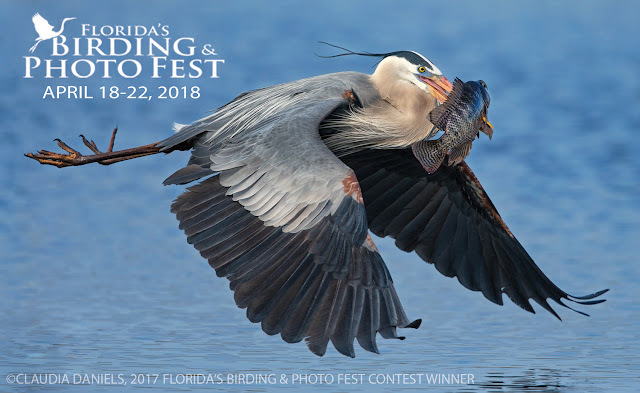 Registration for Florida's Birding & Photo Fest can be made at FloridasBirdingAndPhotofest.com. There is a $25 registration fee, all classes and field workshops priced individually. For more information, contact Erin Masters, (904) 209.4422 or emasters@floridahistoriccoast.com.